Every public relations student dreams of having a great portfolio to bring with them to job interviews, but this is easier said than done. If your Chapter doesn’t have a student-run firm, there aren’t a lot of obvious ways to give your members experience and pieces for their portfolios. Look for organizations that are trying to promote an event or increase membership. Offer your services for free and use university tools to promote the event. Your community probably has a nonprofit looking to create awareness or promote an event. Plus it’s very likely they’re looking for donations. Create a list of organizations and contact them about the services you can give them, such as creating a media kit or writing press releases. Look for small businesses in your community who may have just opened or are a favorite of one of your members. You can work with them to promote a special event or an event they host to give back to the community. Is there a department at your university looking to start using social media, or who’s avidly searching for event attendees? Ask your adviser or department chairs around campus if they know anyone who needs your services. Set up expectations right away with the client. This should include specific tasks, and a plan about how often you will be in communication with them. Make sure you only assign one person to be the client’s contact. Don’t overcommit to a project; your members are college students! Don’t commit to work you won’t have the time or energy to do, as it can damage your (and your school’s) reputation. Hold your Chapter members accountable, set meeting times and stick to deadlines. Soon you and your Chapter will be building your portfolios and gaining valuable public relations experience! 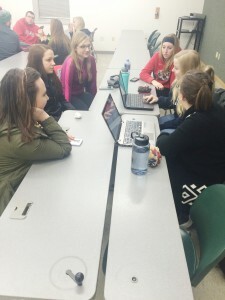 Ashley Vickney is the founding president and current blog editor of the University of Wisconsin Green Bay Chapter of the PRSSA. When she isn’t in class, you can find her with a cup of coffee or tweeting. Connect with Ashley on LinkedIn, follow her on Twitter @ash_vickneyPR or email her at ashley.vickney@gmail.com.